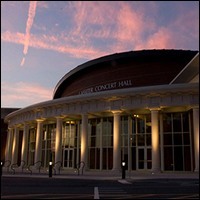 In January 2013 the Cobb County School District unveiled its brand new concert hall on the Lassiter High School campus. The concert hall was specifically designed for instrumental and choral concerts. Construction is complete with Greek style columns, 1,000 plush cushioned seats and professional acoustics. The concert hall is open for use by all Cobb schools as well as the surrounding community and is the home of the Cobb Wind Symphony.